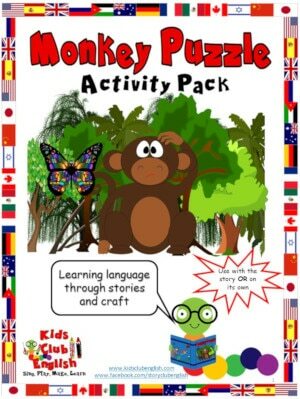 This exciting Monkey Puzzle Activity Pack can be used to support children’s learning in a variety of ways. Support learning about animals, body parts and physical appearance, whilst also building on literacy and vocabulary skills. Storytelling cards are also included for use WITHOUT THE BOOK. Following activities in the pack, children will also develop fine motor skills through colouring, tracing, cutting and sticking to create the various crafts whilst being encouraged to listen, follow instructions and develop social skills. Activities are specifically designed to allow for differentiation of ability and context and come complete with COMPREHENSIVE ACTIVITY SUGGESTIONS. * Storytelling Cards – Use as an alternative to the book or for a change of focus when re-telling the story using a more interactive approach. Suggested questions given on the prompt cards will allow you to further involve children whilst also provide further opportunity for key language focus and comprehension checks. 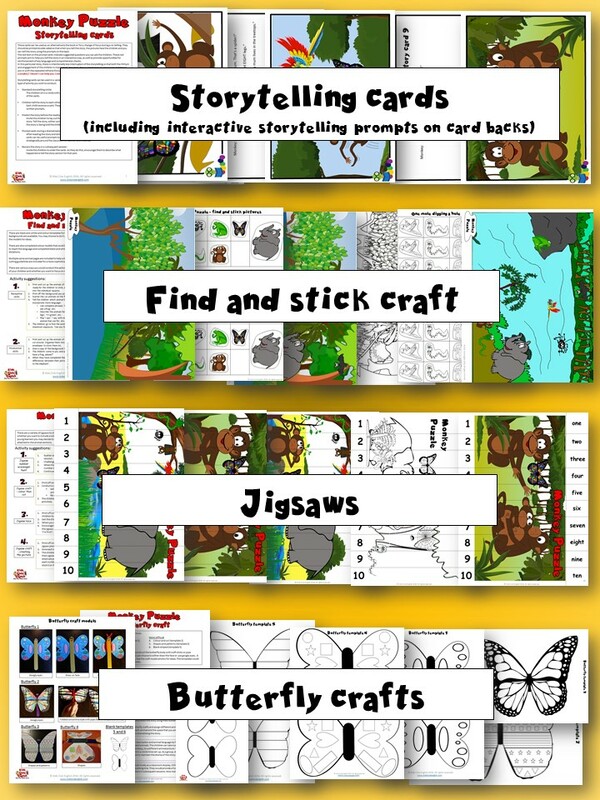 * Find And Stick Craft – Follow the activity suggestions for fun finding games that will help to develop receptive skills, animal recognition or focus on similarities, differences and descriptive vocabulary. Involve children in the preparation of the craft to practise cutting and sticking and develop fine motor skills. * Monkey Puzzle Jigsaw – Choose from a variety of jigsaw templates depending on the level of difficulty required. Follow the activity suggestions to create more learning fun with a scavenger hunt, jigsaw race or jigsaw craft. * Butterfly Craft – Using the templates provided, allow children to practise their craft skills to create their very own butterflies then see if they can use them to follow and re-enact the story. Alternatively, use the butterflies to create a colourful display which could be used to focus on number, colour or shape learning. * Monkey Marionette – Three versions are provided depending on the level of difficulty required. Children can practice their fine motor and cutting skills whilst following the instructions to create their monkey marionette. Focus learning on body parts and follow the activity suggestions for more fun ideas. * Jigsaw Display Mural – Encourage children to work together to colour and assemble this attractive wall display. 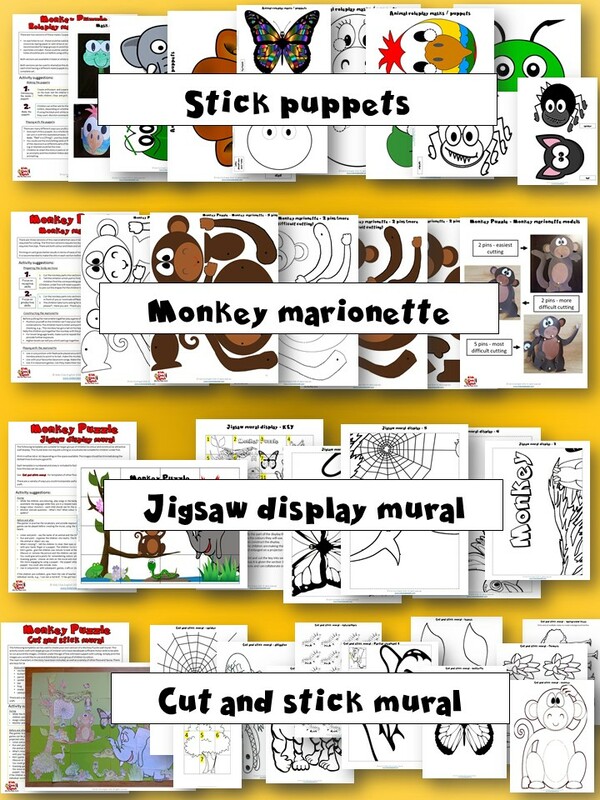 Add further to the display with the cut and stick mural templates and follow the activity suggestions for fun memory games, colour, animal and number recognition. * Roleplay masks / Puppets – Use the wide selection of templates provided to help children create masks or puppets of the animals from the story which can then be used to take on the character roles and re-tell the story. * Board Games – Three versions of the game are provided; choose the most suitable for your group’s ability and follow the activity suggestions for further ideas to support learning about animals, colours, practice counting, literacy and vocabulary skills. Find and stick pictures are also included to allow children to create their own version of the game. * Mazes – Use these fun mazes to practice counting, sequencing and problem solving. 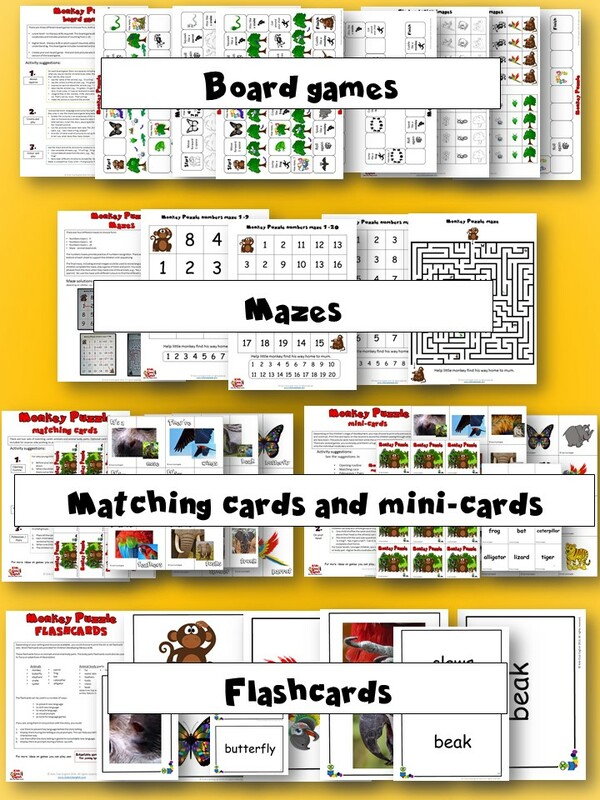 * Matching Cards – Use these cards to play fun matching and memory games. * Mini-Cards – Mini Cards can be used to play more matching and memory games as well as developing word recognition and literacy skills. * Flash Cards – Use in a variety of ways to introduce and practice new language, develop literacy skills or as visual prompts for language games. The above images demonstrate what is provided in this pack. Download the preview for a closer look at the pack contents: Download Preview The entire pack contains 328 pages of information and resource templates! See the preview for the SUGGESTED LANGUAGE FOCUS and the complete list of vocabulary items included in the card sets. Please note the Monkey Puzzle story is not provided with this resource but is available in major book stores. You can also get our FREE Simplified Powerpoint Story and access collections of storytelling videos on our Monkey Puzzle Story Resource Page. There are also lots of other related games and songs there too! This activity pack is supplied as a PDF file and is not editable. Please note that parts of this resource require to be printed and self assembled. For best results Kids Club English recommends that you laminate flash / mini / matching cards for improved durability. Laminating materials are not included. If you are interested in helping kids learn English through stories, songs and craft, please get in touch. I’m keen to collaborate with like-minded people and welcome feedback.